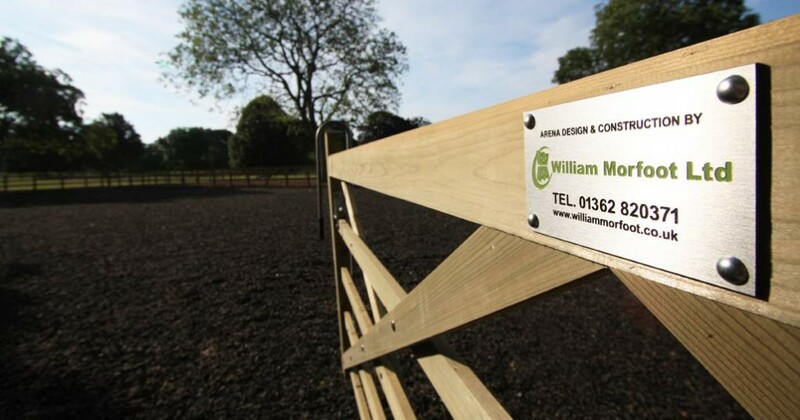 William Morfoot Ltd was approached by the Willis family to look at constructing a new 40 x 20 arena on their paddocks situated behind their farm buildings. The family was looking for a surface to exercise and train their horses and ponies on throughout the year and it was important that the arena surface was suitable for the whole family to use – including some of the young children who were learning to ride. Since the family had extensive riding experience it was clear from the outset that a good quality equestrian surface was fundamental. Keen to showcase a variety of options, we took the Willis family to see an array of examples of other arenas we had constructed in the area. Not only did this inspire additions and requirements to the project, but it enabled us to give the client maximum flexibility in making sure the arena was 100% to personal spec. Sand and rubber was chosen as the surface of choice on account of its consistent performance and all-round durability. We sourced planning permission and work got underway. An automated irrigation system around the manege was installed to make sure that the correct moisture levels were achieved on the surface all year round – a decision that pays off during periods of drought. Just one month later, the construction work was complete and a brand new arena equipped with footpaths, fencing and water pipes to service various paddocks was ready, just in time for the winter! Since completion, the arena has been ridden on every day come rain or shine! Nikki Willis from the family was delighted with the results. William Morfoot Ltd came up with bespoke design options that we hadn’t even considered at the beginning and it was also great leaving the planning and paperwork side of things to them from the outset. We really couldn’t be more pleased with the end result and wouldn’t be without it now!